They’re calling it “an unusual twist on your usual bridal show” … I like that because the last time I went to a bridal show it was lame-o. But the gal organizing this event (Nidhi Bedi – an amaaaazing woman, and one of my good friends) is the complete opposite of lame-o, so I’m sure this show will be fabulous. She said it’ll be an event where the brides get to meet and greet vendors at a bridal show but in a cocktail party setting. Sounds like a winner… especially when you can get in free! 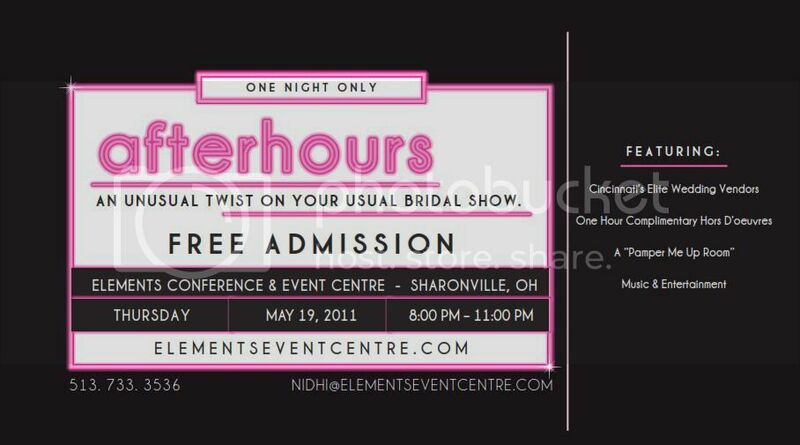 Print it this ticket for free admission to the show! 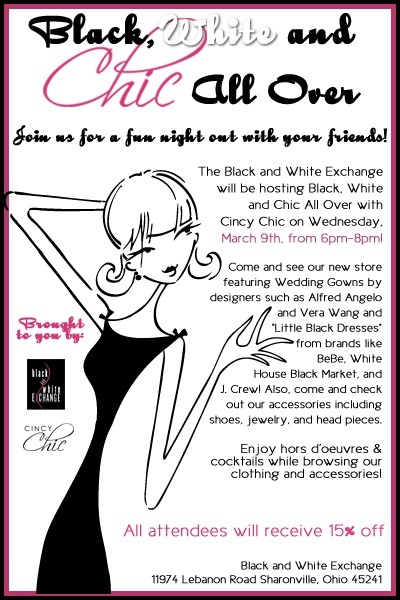 She is the Director of Sales and Marketing at The Elements Conference and Event Centre, and she runs The Black and White Exchange Boutique (BWE), a consignment store we just featured in Cincy Chic. Nidhi told me that after she put on a successful bridal show last year which brought in over 1000 people in three hours, she was approached to launch ABC. Long story short, she loved the idea and ran with it! It will be a national company, but they came to her here locally to start with Cincinnati as the test market. So, here’s the scoop on what ABC will be: It’ll be Cincinnati’s first online based educational resource for the bride. 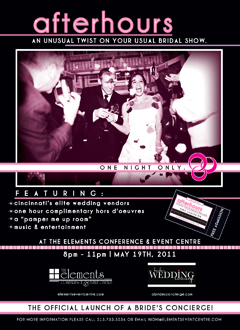 It’ll be where the wedding professionals in each category are there to educate and coach the bride. ABC will feature Cincinnati’s finest wedding vendors, real weddings, engagement stories, listings of what is happening in the city, educational seminars, bridal shows, and their big feature of “Ask The Concierge” which allows brides to come to us with questions that they have and they find the answers from the professionals that know best! So, how can you take advantage of ABC? You can come to the Afterhours event and see the big reveal (they’re making the website live at the event). Or you can visit Nidhi in person! She decided to open up ABC’s “Concierge Lounge” in BWE where brides can go in, shop if they want, and then sit down with Nidhi to come up with a “big day” vision. Nidhi said she’s super excited for brides to visit her at the Concierge Lounge for a free consultation to help develop a vision of what their dream wedding would be like. She’s very connected too, so I’m sure she’ll be a great resource for local ladies who need connections and advice to tie the knot in style. If you need to get in touch with her, just send her an email at Nidhi@Abridesconcierge.com! Black White and Chic All Over! I love the concept of the boutique because you can bring in cute cocktail dresses (or wedding dresses) you’d like to sell and then you can buy new and gently used ones! I hate to be seen in the same cocktail dress twice …but that can get expensive. Sites like renttherunway.com are a good alternative to wearing something new all the time on the cheap, but it’s tough to know what will fit you when you order through a website. So Black & White Exchange is a great way to love it, wear it, and exchange it for something else to love, wear and exchange. See you tomorrow for this fun event! 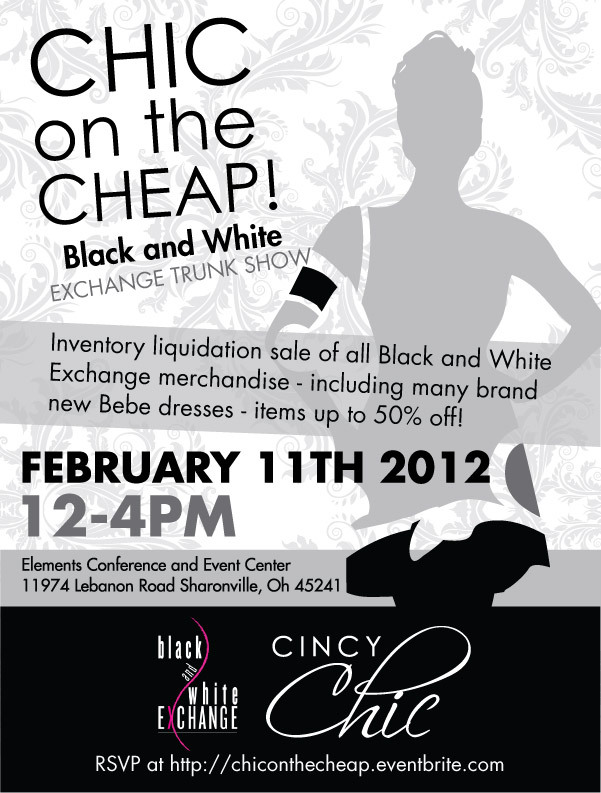 A couple weeks ago, I told you about Black & White Exchange, a new boutique opening in Sharonville. 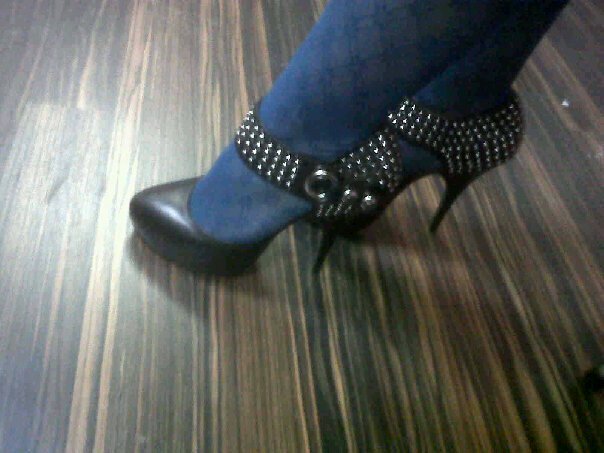 Since then, I went in and got the fierce “Fabushoe Friday” shoes pictured above. They’re Bebe brand (the BWE owner bought a bunch of Bebe stock to start the store) and I get so many compliments on them! To celebrate the grand opening of the boutique, they’re hosting an event on Jan. 26 starting at 6p.m. When I told the owner I’d be blogging about my new hot heels, she told me to say that anyone who comes to the event on the 26th and mentions “Cincy Chic” will get an additional 15% off their purchase. Remember you can buy and sell items there, so if you have any LBDs (or even wedding dresses) you want to sell, bring those with you to the event. See you there!